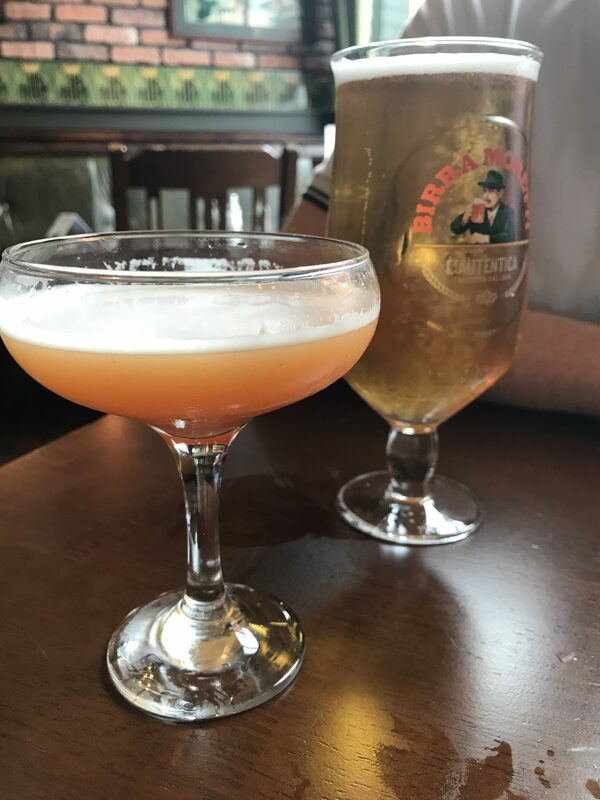 We decided to go on a Sunday so that we could walk into town and both enjoy a cheeky cocktail instead of one of us having to drive. 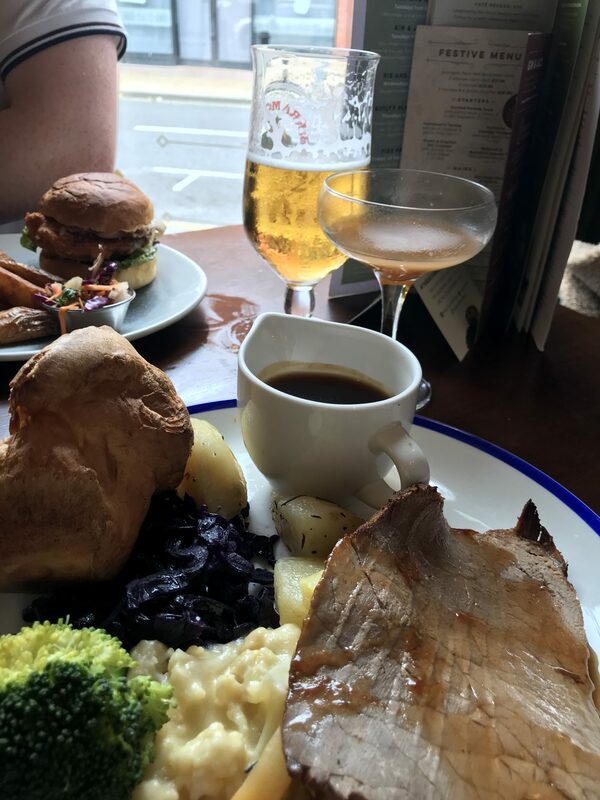 So, for those of you that don’t know, The Devonshire is located on Division Street in Sheffield, so it’s super central whether you want to go for a quiet brunch or use their happy hour as pre-drinks before going out. Division Street is one of my favourite places in town as it’s full of independent stores and quirky pubs. 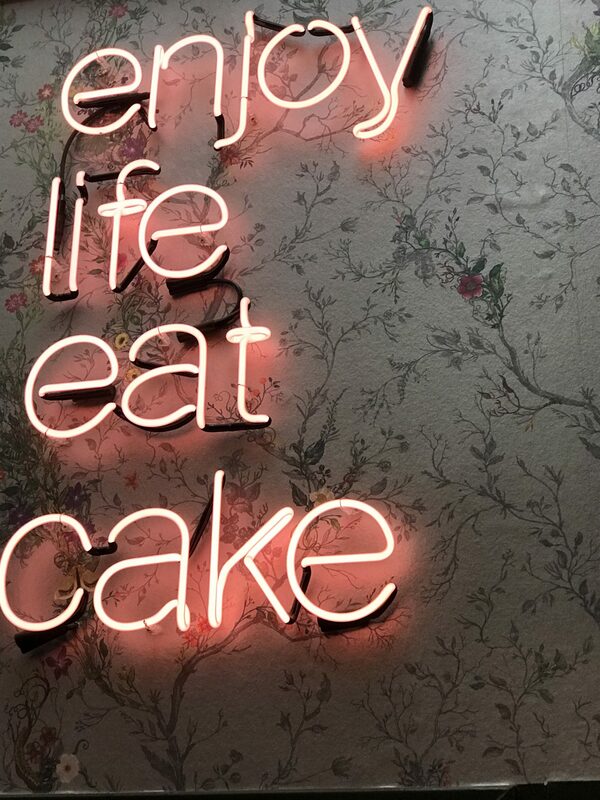 A quick note on interiors before I get on to the food – this place is an Instagram dream. From gorgeous wallpaper and tiling, to local posters of Kes and pink neon signs, there is plenty to look at. Every time I go, I spend most of my time staring at all the trinkets and decor and I always spot something new. Most recently it was the rows and rows of vintage glass bottles adorning the walls. So onto the food, in addition to the usual menu, there is also a specific Sunday Menu on offer from 12pm. I decided to go for the Beef Sunday Roast and I was not disappointed. Now I’d like to point out now that I am FUSSY when it comes to eating a roast or meat anywhere other than at home. I usually avoid a carvery or a roast and I often end up trimming the fat off of meat. I was pleasantly surprised that I didn’t have to do that. What I liked most is that the food all felt and tasted homemade. I opted for beef but you can also get pork, chicken or vegetarian too. The roast potatoes were golden and tasted just like they could have been served at my Granny’s house. The meat was sliced thin and without the fat- just how I like it. The veg wasn’t what I would usually choose but a very Autumnal selection of roasted parsnips, carrots and other root veggies and they were delicious. Not to mention the enormous Yorkshire pudding which I saved til the end to mop up all the gravy. 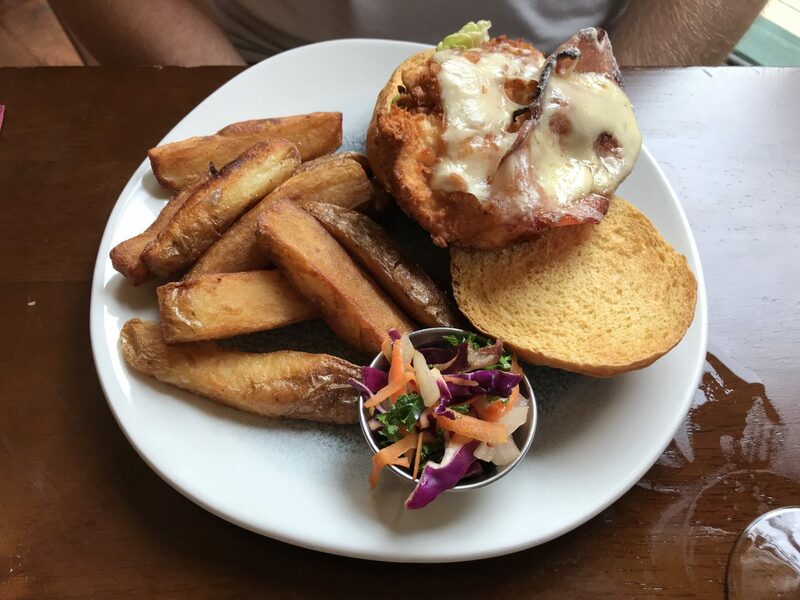 Josh decided to choose from the normal menu, opting for a Buttermilk Chicken Burger with home cut chips which was served with cheese and bacon. He equally enjoyed his and devoured it pretty sharpish. It did make my mouth water a bit too. The usual menu is always available but there are different offers on throughout the week. For example Burger and Beer on a Tuesday or Fish Friday, where you can get Fish, Chips and a drink for a tenner- bargain. We were also treated to a couple of cocktails as I mentioned earlier. The Devonshire has been tweaking their drinks menu recently to include some new and exciting options. To start, I went for the Passion Fruit Martini which was as nice as it sounds. 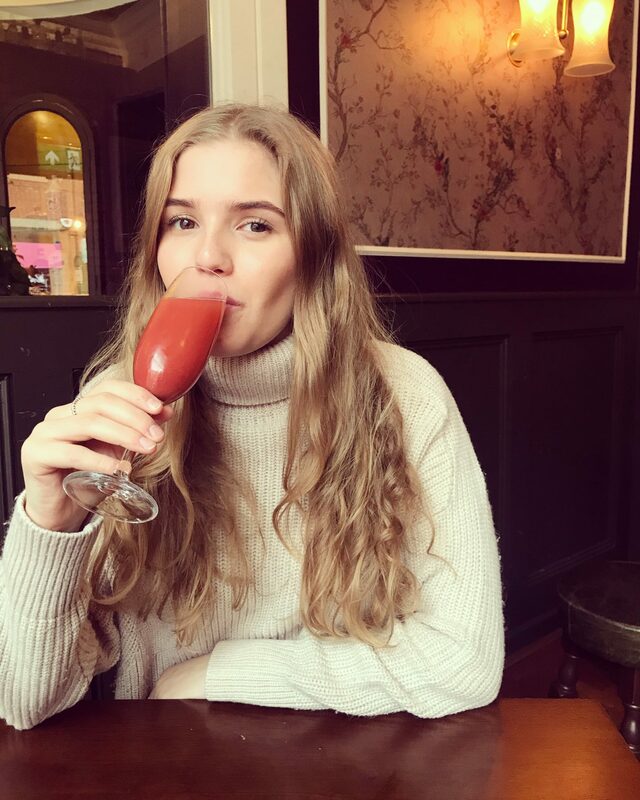 I then washed down the last of my meal with a Strawberry Bellini- there’s something about a Bellini glass thats makes me feel rather sophisticated. Just me? Josh went for a classic pint to start and then got a bit green-eyed looking at mine and also opted for a Passion Fruit Martini in the end. I did also spy behind the extensive bar quite a few gin bottles too, so if that’s your poison you’ll be spoilt for choice. Overall it was a lovely meal. We treated it as a date day as we don’t get to spend that much time together in the daytime now that I’m working full time and Josh is back at uni. I’d go back again and maybe try out a different day of the week to try out some of the other offers….or happy hour. The staff were also super friendly and attentive and it just had a real family vibe to it, at least on a Sunday it did anyway. There were plenty of families with children and couples enjoying a catch up. Although I’m sure it gets more lively after hours when people are going out. Have you ever been to the Devonshire? What did you think? Let me know in the comments below! *The Devonshire invited us to try out their menu free of charge but all thoughts and opinions are my own.